For over twenty years, Patrick J. Baglino, Jr., ASID has gained notoriety and a reputation for creating artful Interiors that reflect the needs and lifestyle of each individual client. Interiors that are innovative, unique and transitional with eclectic twists. It is a design direction that is celebrated and desired by clients and critics alike. In conjunction with the designer's professional know-how, global resources, and lengthy design experience, Mr. Baglino, Jr. consistently sets new standards that become the benchmark of outstanding interior design. It is his strong held belief that first-rate interior design is achieved by listening to a client, understanding their needs and personal style and utilizing that knowledge throughout a successful design process. A strong client-designer professional relationship is the sound foundation for beautiful, comfortably livable yet emphatic spaces of all kinds. Patrick J. Baglino, Jr. is a professional member of the ASID, is NCIDQ certified and is recognized by House Beautiful magazine as one of America's top designers. His work has appeared in numerous shelter magazines, newspapers and blogs. He was the winning interior designer of HGTV's competition series, "Showhouse Showdown". His work in miniature was seen at the National Building Museum in the "Small Stories: At Home in a Dollhouse" exhibit, sponsored by London's Victoria & Albert museum. Patrick serves on the Board of Directors of the ASID (American Society of Interior Designers) Washington Metro as Director of Professional Development. He has earned an ASID 2018 Presidential Citation for his distinguished service to the Society and the Interior Design profession. Considering a renovation? At Aesthetic Answers, we get to know you, help you pinpoint the right choices, and work with you to make them. Then we advocate for you—defend and promote your wishes amongst the other parties involved in your renovation. 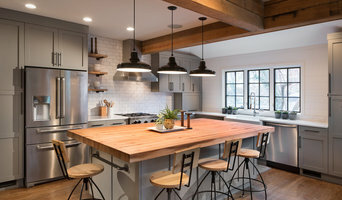 Perhaps you already have a contractor and maybe even an architect—yet you still feel uncertain about which direction to take with layout, interior design, finishes, fixtures, furniture. How will your decisions affect the way you live? Will they fit with what the contractor envisions—or will your ideas get derailed after it’s too late? Our goal is to solve problems, clarify direction, and streamline the transition for you. No matter where you are in the renovation process, we guide you through our time-tested process to support an end-result you’ll love. If you’re worried that a designer will take the reins and you’ll end up somewhere you don’t want to be, with no idea why you got there—that’s exactly what we won’t do. Our process goes from big to small—and we agree, talk, consider, ask “why” at every step—to make sure all the decisions are going to work. The end result? A finished space that you feel comfortable, confident and happy in. You’ll know every decision had a reason, and that every reason was based on how you live. Simply put, it will feel right. How can we be certain you’ll love the result? Because we make sure you’re comfortable and confident at every step along the way. Contact us today to discuss your project. Modern Property Design believes beautiful home decor can be life changing! Modern Property Design provides interior design services, decorating ideas and home decor updates, all at a great value! Need : A Living Room update? A Kitchen update? A Bathroom makeover ? Bedding decor ideas? Affordable design solutions or just some interior design advice. Modern Property Design has you covered. 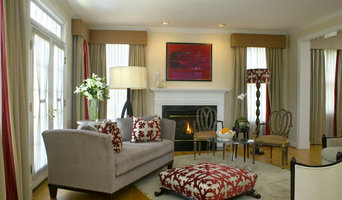 We create beautiful decorated rooms using paint, new curtains trim and molding. vintage and up-cycled materials, design doesn't have to be expensive. The photos on this page and throughout the site - say it all. Contact Modern Property Design - we can't wait to change your life! Superior Home Services, Inc. is a full service design-build firm specializing in new home construction, high-end remodeling, custom homes and historical restoration. Superior Home Services Inc is a recognized, trusted and reputable custom home builder with over 25 years of experience in the District of Columbia, Maryland and Virginia. Our reputation as one of the area’s most trusted home builders and remodelers comes from our consistent track record of unique design, quality construction, expert knowledge and exceptional service. Our collaborative planning process allows clients to imagine every detail of the floor plan and keeps them engaged and involved in the project, from building materials selection, home exterior design, landscaping, and interior details such as flooring, kitchen and bathroom cabinetry, wall coverings, windows and every detail that makes a custom home unique and built to satisfaction. We've been satisfying the needs of the most discerning residential clients in the DC area for almost a decade now. Ones for whom good isn't good enough, Our attention to detail can't be surpassed. We're prompt, we leave your your house impeccably clean and orderly each day of the job, and work continuously once beginning a project. At Merrick Design and Build, carefully planned projects are performed for all of our customers. From kitchen design & remodeling, bathroom designing & makeover, custom basement remodeling and new room additions, to complex whole-house renovations, we listen to you and prepare for the smallest details to ensure successful projects. When it comes to choosing someone to work on your most important asset, you want to be assured you’re choosing quality. From architectural plans and designs, to carpenters and home repair technicians, to the administrative support that pulls it all together, the team at Merrick Design and Build, Inc. is as capable, reliable and experienced as you will find in Montgomery County and NW Washington, DC. Feel free to reach out to us, we would love to hear from you! Personality-driven residential design solutions tailored to a young professional's lifestyle. As young professionals ourselves, we founded Residents Understood as a way to break the typical design mold and bring approachable and affordable design to all. If you're looking for a fresh perspective, you've found it in us - visit our website to learn more about the girls behind the designs! Full service interior design for your Lifestyle and Budget. Or just a consultation to give you good information that will help you make good design decisions. Talk to a Professional Interior Designer if you ..... - Value of your Time as it takes an immense amount of time, thought and energy to live well in your home. - Value of Convenience when your home is easier to live in. - Value the Aesthetic of your home when you are ready to live well and entertain in your home. - Value your Money by planning your changes so furnishings and construction will be an investment of every dollar spent. 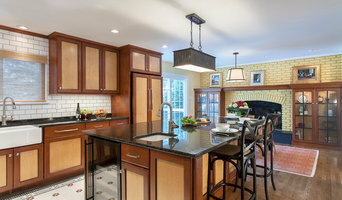 Spectrum is a boutique, award-winning design + build remodeler implementing beautiful, high-quality projects in Washington, DC and other close-in neighborhoods. We often specialize in the area's older housing stock and rowhomes - which tend to require very creative space planning. Our team approach and processes engage each Client into our integrated design-build-remodel company with in-house Architectural Design, Construction Managers, and staff Craftsmen for final project implementation. 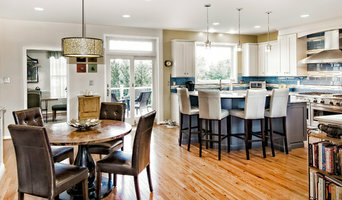 This fosters fully customized remodeling results for every Client's "wants and needs!" The Spectrum portfolio mainly consists of kitchens, bathrooms, additions, basements, apartments, condos, outdoor living, and millwork/storage. We have completed hundreds of projects, stand behind our quality and integrated results by offering a full, 3-year warranty on all workmanship. Our "working mantra" is: Different AND Better Is Better Than JUST Better! !